The Ordinary AHA 30% + BHA 2% Peeling Solution is an extra-strength exfoliating peel that clears away dead skin cells and pore-cloggers to brighten and clarify skin. 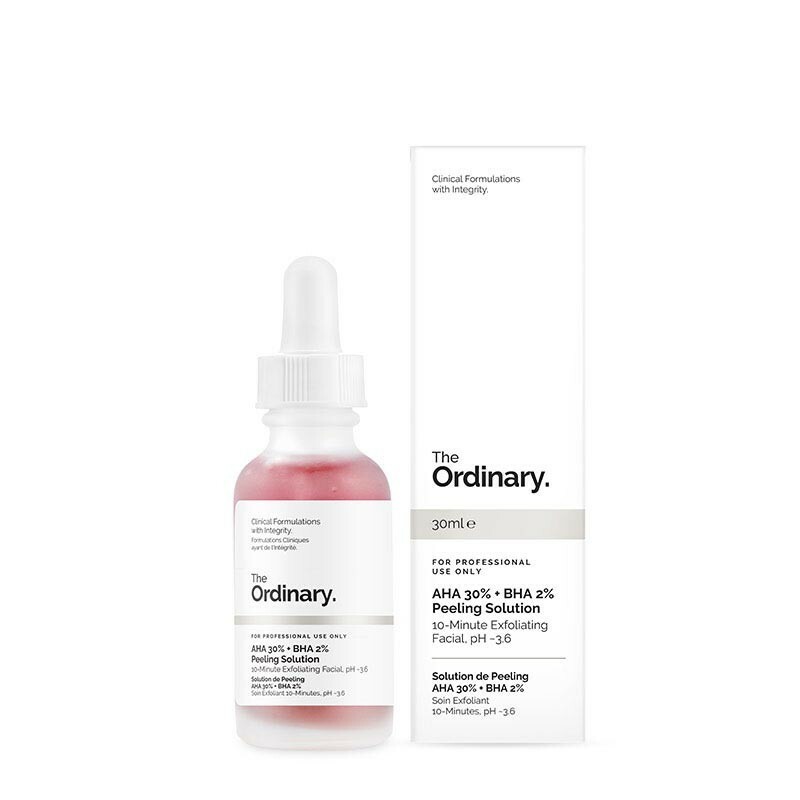 The Ordinary AHA 30% + BHA 2% Peeling Solution combines a highly concentrated, extra strong blend of 30% Alpha Hydroxy Acids including Glycolic Acid and Lactic Acid with Salicylic Acid. It thoroughly exfoliates the surface layers of skin and works to clear congested pores. AHAs clear dead skin cells from the skin's surface, revealing brighter, more radiant, fresher skin. Repeated use improves skin texture, boosts skin cell renewal, and even helps to reduce the appearance of fine lines. Salicylic Acid is a Beta Hydroxy Acid so not only does it exfoliate, it also penetrates into pores to decongest them, working to clear blackheads and visible blemishes. The formula also contains Tasmanian Pepperberry extract to help reduce the irritation, with Hyaluronic Acid to hydrate. Vitamin B5 assists and promotes healing, while Black Carrot extract is a powerful anti-oxidant. This product has a very high concentration of AHAs which can cause irritation, especially if skin has not built up tolerance. This is strong stuff, so we don't recommend it for anyone with skin unused to AHA products or for sensitive skin in general. For an introduction to AHAs, try The Ordinary Glycolic Acid 7% Toning Solution or The Ordinary Lactic Acid 5% + HA 2%. Do not use on sensitised, broken or irritated skin. Always wear a daytime SPF when using products containing AHAs and/or BHAs. Use in the evening ideally, no more than twice a week. Use fingertips to apply evenly to dry skin of face and neck after cleansing. Leave on for no more than 10 minutes and rinse with lukewarm water, taking care to avoid contact with the eyes and eye contour at all times.